Connie Tognoli has developed two Columbian doll patterns. Connie was able to borrow an original 19" Columbian doll and an original 29" doll in making her patterns. Her patterns are faithful reproductions of the original dolls. I emailed Connie and asked to feature her pattern and I'm so glad I did! What a fun email conversation we had. Connie is passionate about the original dolls. 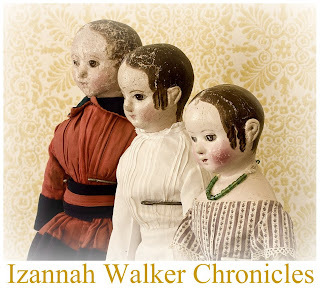 After making my Izannah Walker Workshop pattern I understand some of the decision making involved in making a pattern, and the numerous trial and error to get to a happy place with the pattern shape and design. As you're designing, the decision of how closely to follow the original design is always before you. 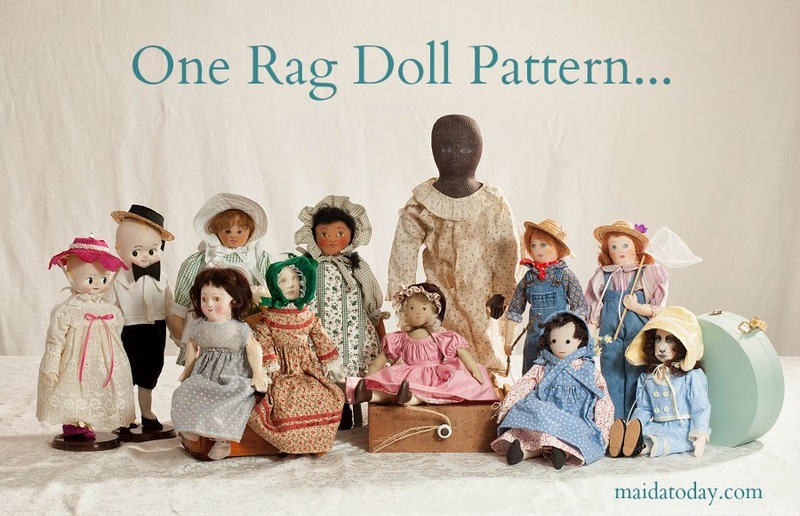 A reproduction pattern follows the lines of the original dolls as closely as possible, making the pattern in the exact same size, and offers the exact same construction and finishing techniques. An inspired by the original pattern allows for more interpretation. The size may be different than the originals, and construction techniques may be slightly different as well. The goal of an "inspired by" pattern is to give an overall feel of the original doll which allows for the design sense of the pattern maker to come into play. In my opinion, both approaches are wonderful. Connie's pattern designing approach was to reproduce as closely as possible the original dolls she was able to study. The dolls were different sizes, and used different construction techniques. Connie is knowledgeable and passionate about antique cloth dolls and Columbian dolls in particular. She made 180 ten inch Columbians for the UFDC Convention Luncheon in Chicago in 2000. She also made a reproduction of the original Miss Columbia which resides with the original Miss Columbia at the Wenham Museum, and her patterns are sold through the gift shop at the Wenham Museum. I first heard about Connie from Cindi Ciampa, who has made Columbian dolls with Connie's pattern as well as Gail Wilson's and Susan Fosnot's patterns. I asked Cindi if I could post pictures of the Columbian dolls she has made here on the Maida Today site. Thankfully, she said yes. But if you want to see some other wonderful dolls that Cindi has made, you should visit Cindi's photo site. 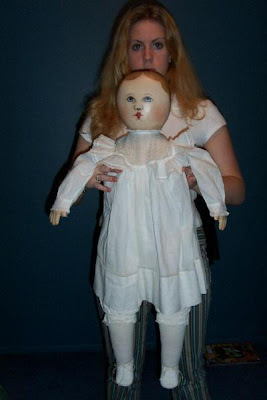 She excels at making antique inspired dolls as well as dolls of her own design. to give a sense of the scale of the 29" doll. Interested in purchasing Connie's patterns? $15.00 for the 19" Columbian Doll pattern. Include $3.00 each for shipping/handling and if you live in California add $1.31 for tax. per pattern. My 19" pattern includes all clothing patterns and complete painting instructions as well as a template for face placement. $15.00 for the 29" Columbian Doll pattern. Include $3.00 each for shipping/handling and if you live in California add $1.31 for tax per pattern. 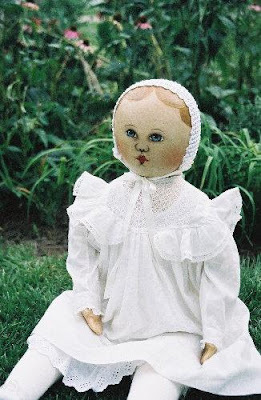 The 29" doll pattern does not include clothes patterns as it is a perfect doll to dress in antique children’s clothing. It does include complete painting instructions and a face Template. Patterns will be mailed out after payment by check is received. Email Connie with questions. Mary Colgan, of the Vintage Cloth Dollmaking group, owns this doll pictured above and below which was made by Connie in 1993. Mary graciously shared pictures here. I HAVE to make a Columbian now. I keep coming back to look at all of these photos. What darling dolls!